Neighborhoods rely on local businesses to bring in visitors and revenue to the area. Some businesses can do a great job of marketing and advertising their own company, but often it’s up to various neighborhood organizations to bring area businesses together to draw participation from local residents, city-wide visitors, and tourists. The foundation for these organizations should be their website. It can be the first touchpoint for new visitors to the area and should show off a good first impression. The following website essentials should be considered when discussing a new or redesigned website. Having an About Us page for a neighborhood organization is of the utmost importance. There are various types of neighborhood organizations—neighborhood associations, chambers of commerce, business alliances, special services areas—and an About Us page is the best place to detail out what your organization does and how it helps the community. It distinguishes your organization from others in the neighborhood or across the city. It could include images and biographies of staff and/or board members, a little history on the organization, and what makes it so important for the community it serves. For those who already know about your organization and need basic information, general info should be easily accessible. Information like address, phone number, and contact email address could be on the About Us page or on its own Contact Us page, but it should also be in a prominent place on the homepage and in the footer or header of the website. Having that info on every page makes it very easy for anyone who just wants some quick general info to be able to find it. You can also embed a Google Map displaying your location on a Contact Us page or in the footer to make it even easier for business owners and residents to find your organization. Links to social media accounts are also vital to add to a website. These help connect your organization to your audience where they want to engage with you most. The easiest way to display your organization’s accounts is to link the logo of the platform to your account page. Everyone is pretty well-versed with the major social media site logos and will be able to choose from there how they want to interact with your organization. If your neighborhood organization connects with businesses in a specific area, a business directory is crucial to have. It’s an easy way for residents and visitors to see what’s in the neighborhood and a way for other business owners to see who is connected with your organization. The links to the businesses helps their search engine optimization by creating inbound links; they should also be proud to be a part of your organization and have a link back to your site as well. A business directory should include the name of the business, the address, the phone number, the website and link, and the category it belongs to. Some business directories just list the businesses with general info, but high-quality business directories can also include a map of the business location and a short summary of the business. The directory should be able to be sorted by various categories and searched by name. A way to go the extra mile for your website visitors would be to create guides for visitors that would include a list of businesses in popular categories like places to eat, shop, stay, and worship, along with places of interest, like local public art or tourist activities. 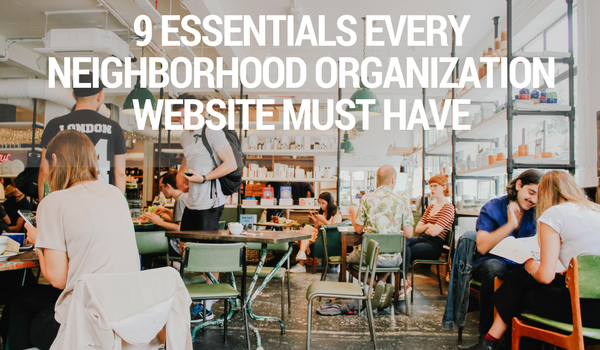 Use your organization’s website to showcase the neighborhood it serves. Use real, authentic photographs of the neighborhood, businesses in the area, residents and business owners, and recent events. Don’t use stock images—it will immediately create distrust between your organization and local residents who know that a location in a stock image isn’t from their neighborhood. Build up a collection of photos to use on your organization’s website. You can do this by having employees photograph events or by crowdsourcing photos from residents (being sure to ask for permission and give credit). You can also hire a professional photographer to take high-resolution photos of the neighborhood and associated businesses so you can be sure that the images will look good on a website. In addition to the About Us page and the business directory, it’s critical to include the services your organization provides and the programs you host. You might have facade improvement rebates available for local business owners or grants for entrepreneurs—put that on your website. Maybe you host farmers markets throughout the summer or host dinner crawls to popular restaurants—put that on your website. You can make it as detailed or as limited of a description as you want, but the more info you give your audience the more they’re likely to know if they’d be interested in attending. Having services and programs listed also helps with your site’s SEO to improve the likelihood that your site will appear in relevant searches connected to the neighborhood. You can create a calendar that not only includes events and programs your organization hosts, but also the events of member businesses in the area. That way there’s a cross-promotional aspect that boosts awareness of events in the area, making it more likely that people will know about the event and want to attend. If you’re the type of organization that has members and those members need to log in to your website for various reasons, add the member log-in page to the navigation, making it easy for members to know where to go and to find the link. More and more people are using their mobile devices to look at websites. Your organization’s website might look really good on a desktop monitor, but if someone can’t look at your website on their phone to find a neighborhood restaurant or shop, it doesn’t matter. Make sure your website has a responsive template so that all of your resources and knowledge in the neighborhood can be the focus. As you work on a new website or a redesign, an easy-to-use back-end should be a priority. The website might look good, but if no one on your team knows how to update the calendar or business directory, the website will eventually fall by the wayside and your organization will suffer. It’s always important to have security measures in place on any website, and a neighborhood organization website is no different. Spammers and malware love to take advantage of vulnerabilities, including forms unprotected by CAPTCHA, comment sections, and easy-to-guess passwords. Beef up your security and help prevent your site from being hacked. See how here. Technically, a Google Local business listing isn’t on your website, but it is essential to spreading the word about your organization and your neighborhood. A Google Local listing provides general information to users when they search for your organization’s name or other relevant search terms. Location and hours are populated, and easy-to-use links also appear so users can make a call (on mobile), find directions, and visit the website. Keeping your Google Local page up-to-date is an easy way to help your audience find out more about the neighborhood they’re interested in. If you have business members, you should encourage them to have a Google Local business listing as well. These listings are visible to users on Google Search and Google Maps, plus it helps with SEO. It also allows for a Google virtual tour, which takes images of a location to a whole other level—it allows users to walk through the space and see how great the businesses are for themselves. Learn more about the benefits of a Google Local listing here. Your neighborhood organization’s website should be the one-stop place for anyone who wants to know more about the neighborhood you’re in and the work that you’re doing. Your website should make it easy for visitors, residents, and business owners alike to find what they want, to see what they need, and to ultimately partner with you to serve the neighborhood better. Want to know more about how to make your organization’s website stays current and useful to your audience? Download our free Website Maintenance Checklist now!